The CDA, available in full from ARES, evaluates damage, munition remnants, known operators and systems in the region, and other contextual information in order to identify the most likely munition employed in the strike. The Hakim A series precision guided munition (PGM) manufactured by GEC-Marconi Dynamics was identified by ARES as the munition in question, employed by United Arab Emirates Air Force (UAEAF) multirole fighter aircraft. 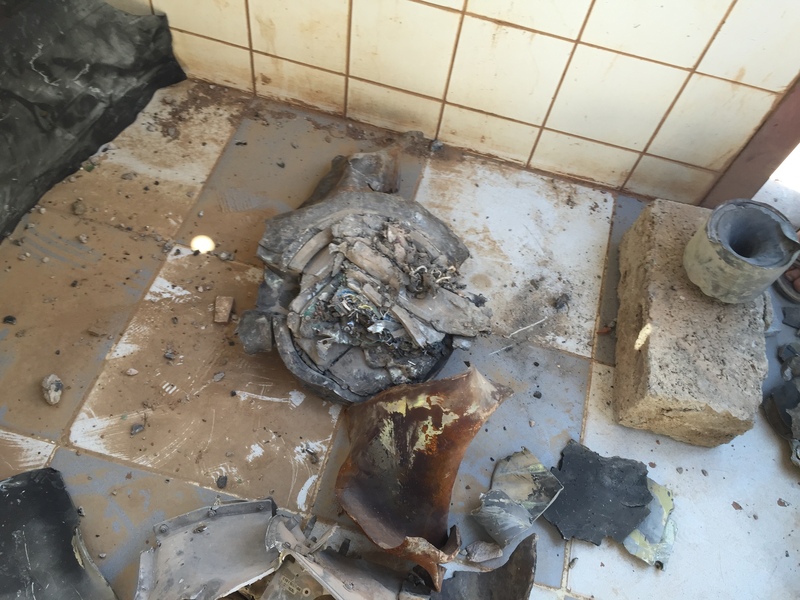 Remnants from the 23rd September strike which hit a ceramics factory in Matnah. Note the solid rocket motor venturi atop the cinder block in the top right of frame. A recovered synthesizer module displaying a GEC-Marconi Dynamics label. ARES assesses with high confidence that one or more precision guided munitions of 200 kg – 300 kg net explosive quantity (NEQ) struck Site YEM049. The impact site most visible from the available imagery (designated Site YEM049-Alpha) is consistent with this assessment (see Figure 1.2). Given the lack of significant fragmentation damage to surrounding areas and the presence of a solid rocket motor venturi, we currently assess that the munition in question was not a conventional aerial bomb, such as the General Purpose Low Drag (GPLD) Mk 82. Further, the impact site damage is not consistent with the limited damage attributable to precision guided air-to-surface missiles primarily intended for use in the anti-tank role. 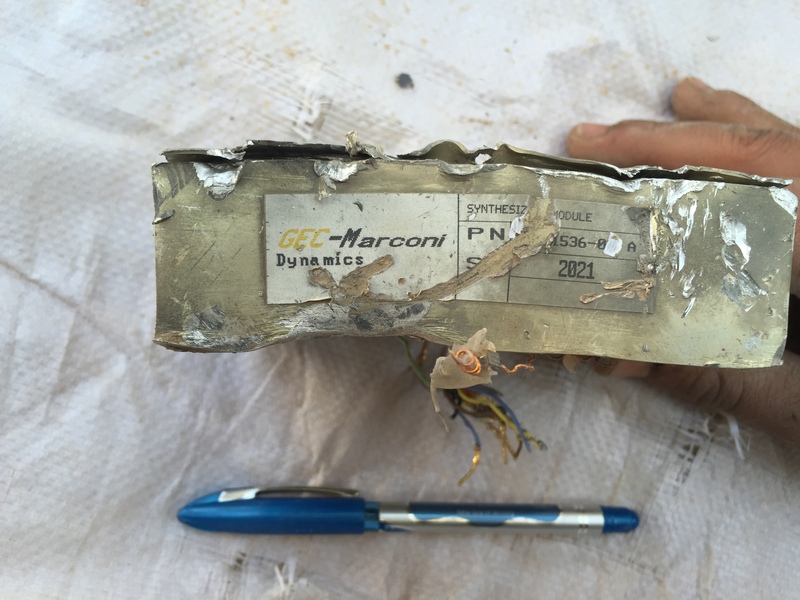 When compared to the order of battle of the known combatant parties and their respective ordnance inventories, we assess with high confidence that at least one of the munitions which struck Site YEM049 was a Hakim A series precision guided munition (see details below), very likely delivered by a United Arab Emirates Air Force (UAEAF) Dassault Mirage 2000-9 or F-16E/F ‘Desert Falcon’ fighter. Hakim series weapons were developed from early designs designated the PGM-1 and PGM-2, first undertaken by International Signal and Control (ISC), based in Lancaster, Pennsylvania, United States in the mid-1980s. Funding for the development came from the United Arab Emirates (the government of Abu Dhabi, specifically), and the weapon was developed specifically for use with the Dassault Mirage 2000 fighter aircraft. ISC was acquired by Ferranti International in November 1987. In 1991 Ferranti’s missile business, including the PGM series, was acquired by GEC-Marconi following substantial financial damage incurred by the acquisition of ISC. Ferranti declared bankruptcy in 1994. These projects were further developed by GEC-Marconi Dynamics, one of a number of subsidiary companies in the GEC-Marconi group, headquartered in Stanmore, UK. According to one source, in 1992 “about half GEC-Marconi Dynamics’ orders [were] for export”. Subsidiaries of GEC-Marconi, including GEC-Marconi Dynamics, were later merged with Alenia Difesa, a division of Finmeccanica, in December 1998 to form Alenia Marconi Systems. In December of 2001, Alenia Marconi Systems became a part of MBDA along with Aerospatialie-Matra Missiles and Matra BAe Dynamics. Subsequently, MBDA continued to market the PGM 500 and PGM 2000 series precision guided munitions. Another Hakim A series munition was documented on 5 November 2015, misidentified by some observers and news outlets as an unmanned aerial vehicle (UAV) or ‘surveillance drone’. 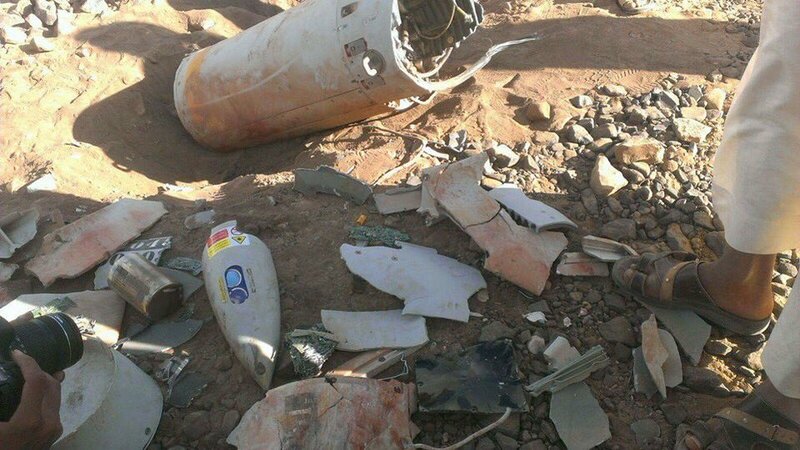 The video below shows locals in the Yemeni governorate of Sadaa gathering remnants of the Hakim A series munition that appears to have failed to function, impacting an open field. A comparison of remnants from both strikes shows the clear similarities. Hakim series munitions are rocket-assisted guided aerial bombs, fitted with either a 500 lb (Hakim A series) or 2000 lb (Hakim B series) warhead. Hakim series munitions were developed as a modular system, capable of mounting interchangeable semi-active laser, TV, or imaging infra-red (IIR) terminal guidance systems. These were designated Hakim 1, Hakim 2, and Hakim 3 respectively, with the A or B designation following depending on the payload weight of the munition (e.g. Hakim 1A, Hakim 2B, etc.). According to the Stockholm International Peace Research Institute (SIPRI) export database, the export of 1750 Hakim series munitions (a combination of both the 500lb and 2000lb variants) to the UAE was approved by the British government, with deliveries taking place between 1989 and 1998. These indicative technical specifications are drawn from official MBDA and GEC-Marconi documents. The Hakim A has comparable specifications to the PGM 500. Images of the 23 September 2015 strike provided by the Mwatana Organisation for Human Rights. Header image from 5 November 2015 strike.